Budget-priced rooms with free Wi-Fi and a U.S.-101 location near Baker Bay are the high points of a stay at Heidi's Inn for our guests in Ilwaco. Heidi's Inn has 25 motel rooms and one dorm room in a two-floor building with exterior corridors and no elevator. Microwaves mini-fridges coffeemakers free Wi-Fi and cable TV with HBO are all standard and non-smoking rooms are available. The motel also has a laundry facility a lobby computer a 24-hour front desk and free parking. Small pets are allowed for an additional fee. Heidi's Inn is in Ilwaco on Spruce Street/U.S.-101 about a quarter-mile from Baker Bay and about a half-mile from the fishing charters. North Head Lighthouse in Cape Disappointment State Park is three miles from the motel and the good times are rolling in Long Beach also three miles away featuring bumper cars arcades and shopping. 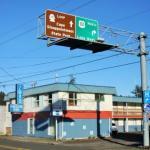 The Portland metro area and Portland International airport are about two hours and 15 minutes from the hotel.